As campuses across the United States prepare for a new administration, many in the international education community are facing difficult questions from international students and scholars seeking answers and assurances. On Friday, November 18, the final day of International Education Week 2016, NAFSA hosted its inaugural International Education Town Hall, the first in a series of online forums designed to bring together the international education community in a time of uncertainty and change. Ravi Shankar, NAFSA Board of Directors vice president for professional development and engagement, and Sam Brown, NAFSA chair-elect of the Knowledge Community for International Student and Scholar Services (KCISSS), brought together the international community to share, listen, and learn about how we move forward. Ravi Shankar is the director of the International Office at Northwestern University in Evanston, Illinois, and vice president for professional development and engagement on NAFSA’s Board of Directors. His NAFSA member-leader experience began in Region V as a community college representative. He has also served as KCISSS representative; regulatory representative; Region V chair; a member of the Membership Committee; chair of the NAFSA Task Force on Online Case Management Tool (currently known as IssueNet); a member of NAFSA’s Diversity Statement Task Force; member-at-large on the Leadership Development Committee; and chair of the Leadership Development Committee. His area of specialization includes intercultural communication, program development, and nonimmigrant regulation. 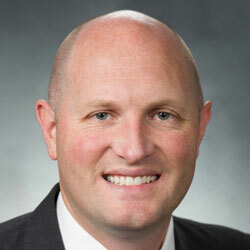 Sam Brown is the director of international student and scholar services at Brigham Young University. Prior to his work in the international student and scholar services office, Brown worked in the university’s public relations and multicultural student services offices. He has served as the KCISSS regional liaison for Region II and is currently the KCISSS chair-elect. Brown received his BA, master of public administration, and doctor of education degrees from Brigham Young University, and is currently working on a masters in academic advising from Kansas State University.